All eyes will be on Game 6 of the NHL’s Eastern Conference finals this evening. And while we don’t yet know whether the New Jersey Devils will eliminate the Rangers at home or whether New York will force its third Game 7 in as many series, regardless of what happens, there are some things we can predict with certainty. A couple of weeks from now, NHL commissioner Gary Bettman will walk out onto the ice. People will boo him, as they always do, and he will be completely impervious to it, as he always is. He will drone merrily for a bit, then present the Stanley Cup to the winning team’s captain. And that captain will be, with my apologies to Don Cherry, a GOOD AMERICAN BOY. O beautiful for tenacious guys! Let’s meet them, shall we? Sure, L.A.’s goaltender Jonathan Quick — another American — has been the team’s backbone and backstop all season. 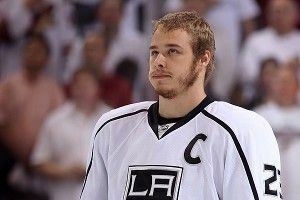 But if it weren’t for team captain Dustin Brown, there’s a very good chance the Kings wouldn’t currently be lying around sunning themselves in Lord Stanley’s backyard, waiting for New York or New Jersey to come over and play. From Ithaca, New York, Brown spent a few seasons playing for the Guelph Storm in the Ontario Hockey League (he overlapped for a year with Ryan Callahan) and was picked 13th overall by the Kings in the same 2003 draft that yielded Zach Parise at 17. The youngest captain in team history when he was given the honor at the age of 23, Brown has been the picture of consistency, recording 53, 56, 57, and 54 points in the four seasons since. He’s also remarkably durable, having missed just two regular-season games in that span while playing a bruising type of hockey. Brown is literally nearly toothless, but figuratively the opposite of the word. He hits hard and heavy, and has a knack for drawing penalties on frustrated or just utterly outmatched opponents. (In fairness, he occasionally does have a knack for the art of the dive.) Sports Illustrated’s Michael Farber called him “a clenched fist on the ice.” Even his baby son can be a target for his father if he sets himself up along the boards in the corner. His opening-round hit on Henrik Sedin was one of the series’ small but pivotal moments. 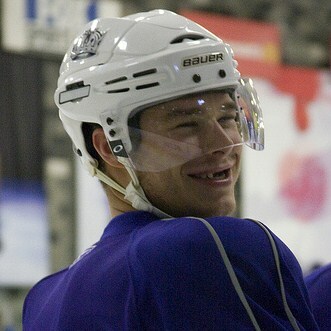 (He also netted four goals and added an assist in the first three games, all of which were won by the Kings.) He scored twice in Game 4 against St. Louis for the series sweep, and against the Phoenix his physical play continually rattled the Coyotes and shook them off their game. The son of J. P. Parise, a former professional hockey player who also represented Team Canada in the 1972 Summit Series, Zach Parise may not have the purest of below-the-border bloodlines. Still, for all you birthers out there, he’s the real deal. He spent two years playing college hockey at North Dakota, where he was twice nominated for the Hobey Baker Award, and was picked up 17th overall by the Devils in the 2003 draft. Since then, he’s scored at least 30 goals in five of his six healthy NHL seasons; last year he only played 13 games due to a knee injury. Like Brown, he was named an alternate captain of the U.S. Olympic team in Vancouver, and his game-tying goal with 24 seconds left would have gone down as one of the great moments in American sports lore had pesky Sidney Crosby not ultimately won the gold medal for Canada in overtime. Parise’s pending free agency and his combination of natural talent and remarkable work ethic — even as a teen, he made himself go to bed at 9 p.m. because “that’s what hockey players did” — has made him (along with Ryan Suter, another USA boy!) one of the most highly coveted players of this upcoming offseason. Many teams are said to be interested, including his hometown Minnesota Wild and the crosstown New York Rangers. (Da-aaaad!) Which is why, to many Devils fans, this postseason run feels like it’s for more than only the Cup. Best of all, Parise makes even Canadians jealous. Asked what player he would want to be if he could un-retire, Steve Yzerman — now the GM of both the Tampa Bay Lightning and the Canadian Olympic team — selected Parise. Let’s just hope it’s not a ploy to lure him into obtaining dual citizenship. We had him first. From Rochester, New York (where he grew up great friends with the Devils’ Stephen Gionta), a teenage Callahan hoped to play in the Ontario Hockey League, but wasn’t on the radar screens of any teams or scouts. A personal favor between his agent and the coach of the OHL’s Guelph Storm led to his being drafted by the team — in the 15th and final round. He scored 31 points his first season, 68 the next, and put up 84 in 2005-06. And here’s how we know he’s a righteous citizen: Asked by MSG networks what the most embarrassing song was on his iPod, he admitted it was Miley Cyrus’s “Party in the USA.” No need to be embarrassed about that patriotic gem, Cap’n Cally! I just listened to it on repeat for an hour.